In a recent post on her profile, Fidji Simo, VP Product at Facebook, has unveiled a new feature for Groups. The feature, which is currently being tested with a few Groups, is called ‘Watch Party’ and allows users to watch videos with their friends. Group administrators can include any public video on Facebook in a Watch Party, both live and prerecorded. 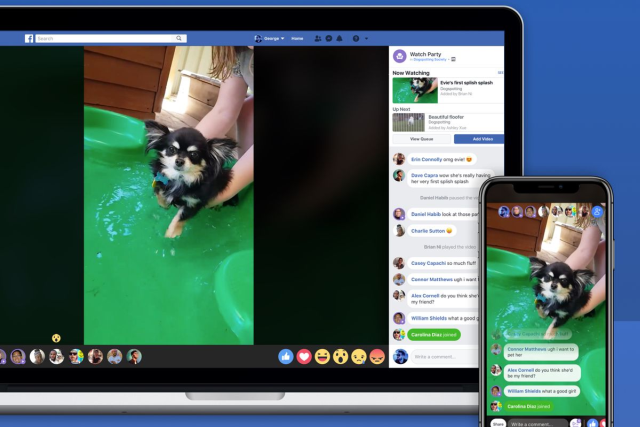 Facebook claims that the goal of the new feature is to make watching videos a fun and social experience, rather than a passive one. In order to start a Watch Party, Group admins or moderators can select one or more videos and post them to the group. When the party is live, Group members will see a Watch Party widget on the group’s page. Upon joining a Watch Party, members will automatically see the video everyone else is watching. If the Watch Party includes more than one video, members will be able to see which video is coming up. Group members will be able to comment and react in real time, and if they’re on mobile devices the comments will be displayed in an overlay on the video. The company claims to have introduced the new feature in order to encourage social interaction on the platform. Turning existing videos into a live event with a number of people watching makes them more interesting for the viewers, Facebook said. “As we think about video on Facebook, we’re focused on creating experiences that bring people closer together and inspire human connection instead of passive consumption”, Simo added. As of now, the company hasn’t revealed when the feature will go live for all groups.